Mayonnaise history: Was it invented by the French or the Spanish? 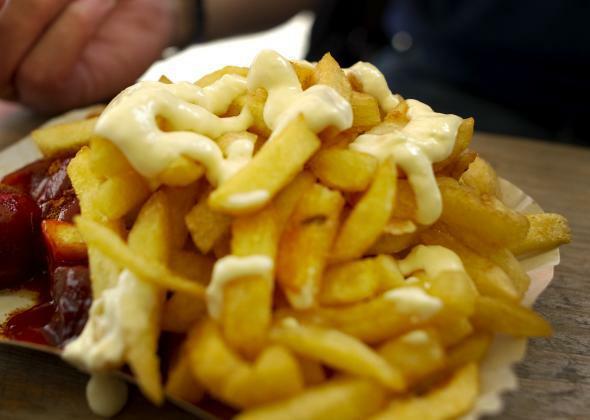 Mayonnaise tastes amazing on French fries, but it’s not necessarily French by origin. Elsewhere in Slate, David Merritt Johns asks why mayonnaise inspires fervent hatred, Ari LeVaux tries to find out why Hellmann’s is so good, and Katherine Goldstein argues in favor of a surprising mayonnaise alternative. “Mayonnaise … is ketchup’s dark twin—loved by some, reviled by others, setting brother against brother wherever it is spread,” wrote the novelist Gabriel Roth (a friend of mine) in a 2003 column for the San Francisco Bay Guardian. As I detail today in “Mayo-phobia”, there are some people who despise mayonnaise “with the passion of a thousand burning suns,” as one inflamed mayo critic recently attested on YouTube, while others (like me) adore the sauce and incorporate it into our bodies with piggish abandon. While this blistering debate over the merits of mayonnaise reached its boiling point only in recent decades, controversy has haunted the egg-based sauce from the very beginning. However, originally the disagreement was not about whether the condiment was good or bad, but rather who could claim bragging rights—France or Spain—for first spreading mayo’s gelatinous gospel. This creation tale came under assault a couple of generations later from a French gastronome who sniffed that Port Mahon was not exactly known for its haute cuisine. He felt Gallic provenance was more likely, and that the sauce might originally have been called bayonnaise after Bayonne, a town famous across Europe for its succulent hams. Other advocates of French authorship suggested the name came from manier, meaning “to handle,” or moyeu, an old French word for yolk. By the 1920s, the Spanish were lashing back: a prominent Madrid chef published a pamphlet calling on his countrymen to reject the phony francophone term mayonnaise in favor of salsa mahonesa. Present day food writer Tom Nealon emphatically endorses the Spanish view. “The fact that mayo doesn’t show up in any of the initial 17th century [French] recipe collections … does seem to confirm that the French didn’t have the ‘technology’ for mayonnaise until the 18th century,” he explained. But Andrew Smith, the author of several histories of mayonnaise, is not so sure: “All of the early recipes say French. I believe it,” he said. There is no question that the French popularized the sauce. Starting in the very early 19th century, the word mayonnaise (or magnonnaise) began to appear in German and British cookbooks dedicated to French cuisine. Talk of mayo quickly made its way to the United States, often on the lips of migrating French chefs, such that by 1838 the gourmet eatery Delmonico’s in Manhattan was offering both a mayonnaise of lobster and a chicken mayonnaise. The salad provided the initial beachhead for mayo’s colonization of American cuisine. Beginning in the late 19th century, elite eaters went bonkers for mayo-drenched potato salads, tomato salads, and Waldorf salads, an elegant mélange of apple, celery, walnuts, and mayonnaise. The sauce was terrific for disguising flaws in vegetables, and its superior binding capacity made it a natural for sandwiches—mayo’s second great platform—which took off as a brown-bag lunch staple following the invention of the mechanical bread slicer in the 1920s. By 1923, the great white condiment’s star was rising so fast that President Calvin Coolidge was inspired to tell the press that the one treat he simply could not do without was his Aunt Mary’s heavenly homemade mayonnaise. The President’s nostalgia for his aunt’s luscious sauce was a reflection of broad changes that were afoot in the American food production system. Handmade mayonnaise was fast becoming quaint: Spurred by the condiment’s popular momentum and the spread of refrigeration, hundreds of industrial manufacturers flooded the packaged mayo market. Hellmann’s, a New York City brand with fat jars that could accommodate giant spoons, came to dominate the sector. “Mayonnaise, which had heretofore been considered a luxury, has now become a staple and a table necessity, not only in the homes of the rich, but also at the workingman’s table,” observed an industry publication in 1937. Mayo had come to the great slathering masses. Too bad not all of them were happy about it.